We depend on our digestive system and the gastrointestinal tract specifically to process the foods we eat. Any interruption of this process can cause a delay in the elimination of waste products from our body. 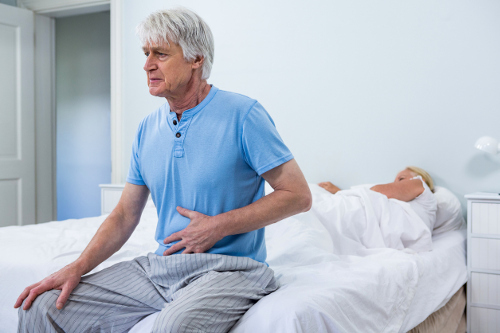 This is referred to as gastroparesis, and while it is not a life-threatening condition alone, it can lead to serious complications. We will explain how this happens and how it differs from an obstruction. We will also provide you with a suggested gastroparesis diet to prevent delayed gastric emptying. This condition is commonly referred to as delayed gastric emptying because the food content within the gastrointestinal tract is stopped or slowed due to an injury rather than an obstruction. This can happen as food travels from the stomach to the small intestine. Our body usually uses the stomach muscles to break up food and move it along the tract. These muscles are controlled by the vagus nerve, and when it is damaged or suffers trauma, the food is slowed or stopped along the process. This is the gastroparesis condition and results in slow digestion. Most cases of gastroparesis cannot be linked to a particular cause. It can be associated with conditions affecting the stomach nerve signals with injury or trauma. It frequently arises in those with diabetes since the vagus nerve is affected by the high blood glucose levels in diabetics. Cases of gastroparesis produce symptoms ranging from mild to severe in nature and may intensify each time they occur. Gastroparesis symptoms may be stimulated by consuming foods high in fiber or foods that fall under the greasy category. The following symptoms can also be present after drinking carbonated drinks or drinks with high fat content. An effective diet for gastroparesis should address the possible issues with the digestive and gastrointestinal processes. The stomach usually empties after a 90- to 120-minute period, with muscle contractions of three per minute. The entire process can be delayed for hours, causing some the symptoms to be intensified. It can also lead to malnutrition. A gastroparesis diet ensures the body receives proper nutrition and sufficient fluids while alleviating symptoms. Step One – Liquids, liquids, liquids. By having an abundant amount of liquids, dehydration can be prevented and essential salts and minerals can be replenished. This stage is to be followed for three days. Step Two – Certain fats found in food can aggravate the symptoms of gastroparesis. Once patients are at this stage, small amounts of dietary fats can be slowly introduced with less than 40 grams consumed daily. Supplements of multi vitamins may be needed. Step Three – The multi-vitamin supplements are continued. This stage is the beginning of a long-term commitment of limiting fat to 50 grams per day and restricting fiber. Eating small several meals throughout the day. Avoid caffeine, alcohol, fatty foods, and carbonated drinks. Avoid lying down for at least one hour after eating. Consuming soft foods such as pasta, porridge, and yogurt. We have outlined each of the three steps daily menu plan to give you a better sense of a sample menu. 790 calories, 9 grams of fat, 11 grams of protein, 156 grams of carbohydrates, 3,531 milligrams of sodium, and 244 milligrams of potassium. Breakfast – ½ cup of Gatorade, ½ cup of Ginger Ale, ¾ cup of bouillon, 6 saltine crackers. Lunch – ½ cup of Gatorade, ½ cup of Coke, ¾ cup of bouillon, 6 saltine crackers. Dinner – ½ cup of Gatorade, ½ cup of Sprite, ¾ cup of bouillon, 6 saltine crackers. 1,343 calories, 35 grams of fat, 52 grams of protein, 206 grams of carbohydrates, 2,639 milligrams of sodium, and 1,411 milligrams of potassium. Breakfast – ½ cup skim milk, 1 poached egg, 1 slice white toast, ½ cup apple juice. Morning Snack – ½ cup Ginger Ale, ½ cup canned pears. Lunch – 2 ounces of mozzarella cheese, 6 saltine crackers, ¾ cup chicken noodle soup, ½ cup Gatorade. Afternoon Snack – ½ cup of skim milk, ½ cup of Cornflakes, 2 teaspoons of sugar. Dinner – 1 tablespoon of peanut butter, 6 saltine crackers, ½ cup of vanilla pudding, ½ cup grape juice. Evening Snack – ½ cup of frozen yogurt, 6 saltine crackers. 1,822 calories, 42 grams of fat, 75 grams of protein, 286 grams of carbohydrates, 2,234 milligrams of sodium, and 2,467 milligrams of potassium. Breakfast – ½ cup of skim milk, ½ cup of cream of wheat, 2 teaspoons of sugar, ½ cup of orange juice, 1 slice of white toast, 1 teaspoon of margarine, 1 tablespoon of jelly. Morning Snack – ½ cup of low-fat yogurt, ½ cup of Sprite. Lunch – 2 ounces of tuna fish, 2 tablespoons of low-fay mayonnaise, 2 slices of white bread, ½ cup of canned peaches, ½ cup of Gatorade. Afternoon Snack – ½ cup of chocolate pudding, ½ cup of Ginger Ale. Dinner – 2 ounces of baked chicken, ½ cup of white rice, ½ cup of cooked beets, 1 dinner roll, ½ cup of skim milk, 2 teaspoons of margarine. Evening Snack – ½ cup of ice milk, 2 pretzels. These sample menus show the recommended guidelines to follow for proper nutrient intake. If the lifestyle changes and adhering to the gastroparesis diet plan does not produce satisfactory results, a feeding tube may be required. This extreme result may be required to ensure adequate fluids and nutrients are supplied to the small intestine. A gastroparesis diet requires a total lifestyle change and outlook as the foods and beverages you once enjoyed may need to be removed from your diet. The gastrointestinal tract and digestive process can be interrupted and may lead to serious complications. A diet plan focuses on introducing food in a timely manner and limits the portions in order to avoid overloading the system. By following a simple menu of soft, liquified foods, you can enjoy all that life has to offer. “Gastroparesis,” National Institute of Diabetes and Digestive and Kidney Diseases https://www.niddk.nih.gov/health-information/digestive-diseases/gastroparesis, last accessed June 5, 2017. “Gastroparesis,” Medline Plus; https://medlineplus.gov/ency/article/000297.htm, last accessed June 5, 2017. Jackson, F., “Gastroparesis Diet for Delayed Stomach Emptying,” GI Care; https://www.gicare.com/diets/gastroparesis-diet/, last accessed June 5, 2017. “Food and Gastroparesis,” Gastroparesis Clinic; http://gastroparesisclinic.org/treatments.php?pageId=1186&moduleId=204, last accessed June 5, 2017.